WAIST HIGH: Happy 25th Birthday Meat Is Murder. Happy 25th Birthday Meat Is Murder. Released in February 1985, the second album from The Smiths went to #1 in the UK and was the only Smiths album to do so during the band's existence from 1982-1987. Meat Is Murder did not chart well in the US (reaching #110) and the first single from the album, "That Joke Isn't Funny Anymore," reached only #49 in the UK. Track #6, the great "How Soon Is Now?," was originally released as the B-side to "William, It Was Really Nothing" in the UK and was added to the U.S. version of Meat Is Murder after its success on American alternative radio stations. The song was subsequently released as a UK single; charting at #24. 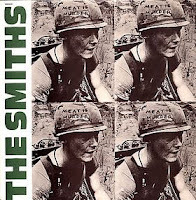 Meat Is Murder was produced by Johnny Marr and Morrissey (credited as "The Smiths") and features a photograph from the 1968 documentary In the Year of the Pig where the soldier's helmet said "Make War Not Love." "My favourite song on that LP now is 'That Joke Isn't Funny Anymore'. I think Morrissey is incredible on that, the end is brilliant. 'Well I Wonder' I really like as well. It's one of those things that a modern group could try and emulate but never get the spirit of. It's so simple. 'The Headmaster Ritual' was a favourite of mine for a long time just because I'm really pleased with the guitars on it and the strange tuning... For my part, 'The Headmaster Ritual' came together over the longest period of time I've ever spent on a song. I first played the riff to Morrissey when we were working on the demos for our first album with Troy Tate. I nailed the rest of it when we moved to Earls Court. That was around the time when we were being fabulous."